Senior guard Seth Clark (Lewis Center/Olentangy) scored 11 points during the final 6 minutes of regulation time as the Ohio Wesleyan men’s basketball team narrowed a 12-point deficit to 3, but his game-tying shot in the final seconds spun around the rim and out as 23rd-ranked Wooster held on for a 75-72 North Coast Athletic Conference win on Saturday in Wooster. The Bishops trailed, 67-55, with 6 minutes left in regulation time when Clark converted a 3-point play to start the comeback. Clark followed with a 3-pointer on Ohio Wesleyan’s next possession, and freshman wing Dawson Tillman (Bellefontaine) stole the ball and fed sophomore post Grant Gossard (Westerville/Olentangy Orange) for a lay-in that to made it a 67-63 game with 4 minutes to go. Wooster ended that Bishop spurt with a Danyon Hempy lay-in, but Clark answered with another 3-point play to bring the Bishops within 69-66 at the 2:37 mark. Reece Dupler hit a jumper from the lane and Spencer Williams sank a pair of free throws to push the Fighting Scots’ lead back to 7, but senior guard Nate Axelrod (Dublin/Coffman) rallied the Bishops with a lay-in and a pair of free throws with :37 to play before the teams traded points with a pair of free throws by Williams and a Clark lay-in. With :08 left, Dupler missed the front end of a one-and-one, giving the Bishops a chance to tie the game, but Hempy got his fingertips on Clark’s 3-pointer and the ball spun around the rim and off. Senior post Adam O’Brien (Wooster) knocked down a 3-pointer to give the Bishops an early 7-4 lead, but the hosts broke a 9-9 tie with a 15-5 run that included 2 free throws, a 3-point play, and a jumper from Williams. Ohio Wesleyan rallied to within 29-24 on an Axelrod 3-pointer, but Wooster followed with a 9-0 burst that included a pair of Eric Bulic buckets to put the lead back into double figures. Gossard, Clark and sophomore guard Jaret Gerber (Worthington/Thomas Worthington) hit 3-pointers during the second half to keep the Bishops within striking distance and set up their run in the closing minutes. Clark led the Bishops with 19 points, while Axelrod and Gossard finished with 17 apiece. Senior wing Will Orr (Johnstown/Johnstown-Monroe) grabbed a team-high 8 rebounds. Hempy led Wooster with 22 points. Sophomore guard Nicole Popovich (Rocky River) sank a pair of free throws to give Ohio Wesleyan a 14-point lead midway through the fourth quarter, but Wooster finished the game with a 21-4 run to take a 68-65 North Coast Athletic Conference win over the Bishops on Saturday in Wooster. Popovich’s free throws put the Bishops ahead, 61-47, with 5:56 left in regulation time. Anna Gibbs answered with a pair of free throws and Aki Shurelds followed with a 3-pointer to bring Wooster within 61-52, but junior guard Erin Delaney (Toledo/Notre Dame Academy) hit a pair of free throws to push the lead back into double figures at 63-52 with 4:11 to play. The Fighting Scots then heated up from the field, connecting on their next 6 field goal attempts. Gibbs connected from long range, then stole the ball and broke free for a lay-in, and after an Ohio Wesleyan turnover, it was Kylie Orr hitting a 3-pointer to make it a 63-60 game with 3:23 left. After another Wooster steal, Sarah Rapacz hit a lay-in to bring the Fighting Scots within a point, but missed a free throw that would have tied the game. Popovich answered with a pair of free throws for a 65-62 Ohio Wesleyan lead with 1:40 remaining, but Shurelds countered with a lay-in and then Gibbs stole the ball and fed Cat Fiorito for a lay-in that gave Wooster a 66-65 lead with 1:08 to play. The Bishops would have a pair of chances to retake the lead, but sophomore guard Claire Sterling (West Jefferson) misfired on a jumper with :47 left, and after an Ohio Wesleyan stop, Gibbs stole the ball from Delaney with :08 left and Sarah Marion hit a pair of free throws for the 68-65 final. Ohio Wesleyan raced to a 5-0 lead on a 3-pointer by sophomore post Elea Karras (Bellbrook/Miami Valley) and a pair of Sterling free throws, and the Bishops would lead for most of the first quarter. The Bishops went on an 8-0 run midway through the second quarter, getting 3-pointers from Popovich and Sterling along the way, and would lead by as many as 9 points during the final seconds of the half. With the contest tied at 46, the Bishops scored the final 7 points of the period, with Delaney and Popovich each hitting a pair of free throws and senior post Hallie Sinko (Copley/Archbishop Hoban) adding a basket. 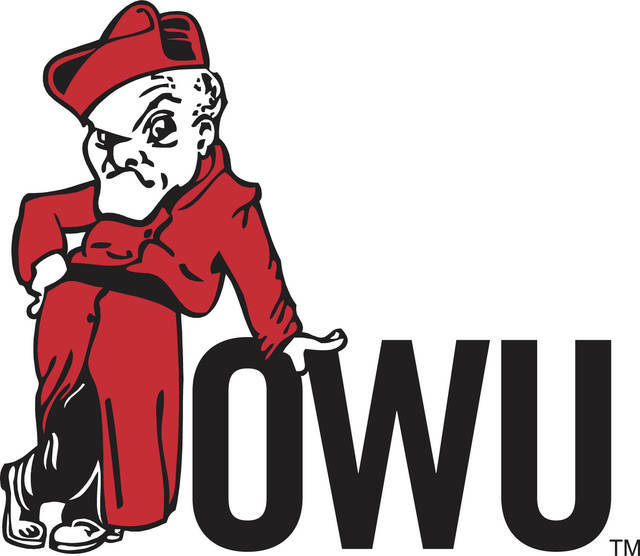 Ohio Wesleyan continued its run in the fourth quarter, holding Wooster without a field goal for more than 9 minutes while building the double-digit lead before Shurelds’ 3-pointer ended the Scots’ drought from the field and started the game-ending run. Popovich led the Bishops with a career-high 20 points and 13 rebounds. Sterling also recorded a double-double, finishing with 13 points and 11 boards, and Karras added 10 points. Gibbs led Wooster with 15 points.